The Punisher Marvel Video Slot Guide & Review - Casino Answers! The Punisher is one of the several Marvel Comics characters to now have his very only Cryptologic video slot! The Punisher slot machine is based on the comic book series with gritty comic book style art. Unlike most of the other Marvel Jackpot slots, it is not a 20 or 25-line video slot, but only 9 lines with 5 reels and 3 rows. It has free spins, a bonus game and of course, three progressive jackpots. The minimum coin bet on The Punisher is $0.05. Other coin value options are $0.10, $0.15, $0.20, $0.25, $0.50, $0.75, $1, $2, $3, $4, $5. This makes the minimum bet on all nine lines $0.45 and the maximum bet $45. Casino Answers strongly recommends you bet the most you possibly can on all 9 lines to optimize your chances at winning one of the Marvel progressive jackpots. The Punisher has a basic autoplay feature that goes up to 99 spins. Hold the mouse button down on the + button to get to 99 faster. 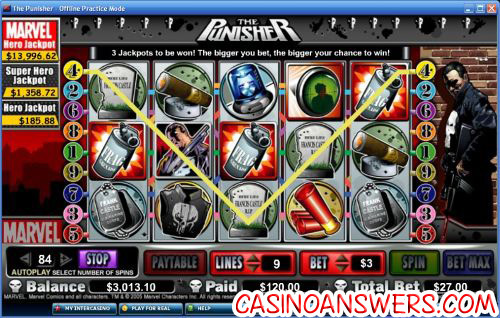 The Punisher video slot game is linked to the three Cryptologic Marvel Progressive Jackpots. These progressive jackpots are all won randomly. You don’t even need to match any symbols. You can increase your chances to win by increasing your bet. When you are awarded one of the Marvel Jackpots, animated text with the name of jackpot you have won will appear to let you know which progressive jackpot you have won. The three jackpots are the Hero Jackpot, Super Hero Jackpot and Marvel Hero Jackpot. Hero will usually be in the $100-$1,000 range, Super Hero in the $1,000-$5,000 range and Marvel Hero in the $5,000-$25,000 range. These are rough estimates and by no means exact indicators of how big these progressive jackpots will be played. If Punisher appears anywhere on reels 1 and 5, you will trigger the free games bonus feature. 10 free spins will be awarded and all prizes will be doubled. 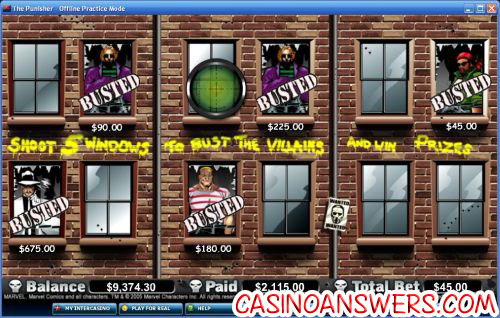 You can win more free spins from the free spins feature, or you can trigger the Villain Hunt bonus game. The free spins will be played at the lines and bet that you triggered them with. The free game wins will be added to your line and scatter wins. As you can see, Punisher is a 9-line video slot that packs quite a punch. You can win a lot of cash and play a slot based on one on your favourite comic book characters all at once. If you’re looking to check out the Punisher slot machine, you can get a 100% up to $225 signup bonus to try it out over at InterCasino. Does the Punisher slot machine have a bonus game? The Punisher video slot features the Punisher Villain Hunt Bonus Game. There is a building with 12 windows and you must choose which 5 of the 12 windows to shoot. Each window will have either a villain or a free game prize behind it. You can win up to 200X your triggering bet per shot. From my own experience, I won $2,115 from a $45 bet playing the Punisher Villain Hunt bonus game. Are there any US-friendly online casinos where I can play the Punisher video slot? Unfortunately, none of the online casinos that host the Punisher slot game currently accept players from the United States. However, that doesn’t mean you can’t play any of the excellent video slots over at Bovada! Is there a slot machine based on the Punisher marvel comic? Is there a Punisher slot machine casino game?